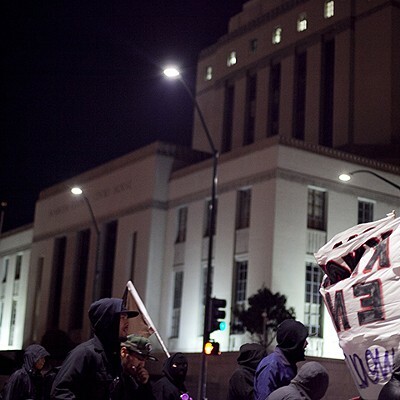 Roughly fifty demonstrators marched from Fruitvale BART on Friday night to Oakland City Hall in an anti-police rally called in response to the fatal shooting of Richard Perkins by Oakland police on November 15. 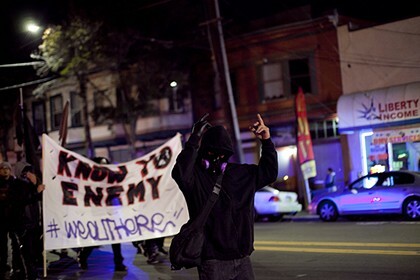 But unlike protests earlier this year, police didn’t try to drive demonstrators onto the sidewalks to comply with Oakland Mayor Libby Schaaf’s policy banning nighttime street marches. 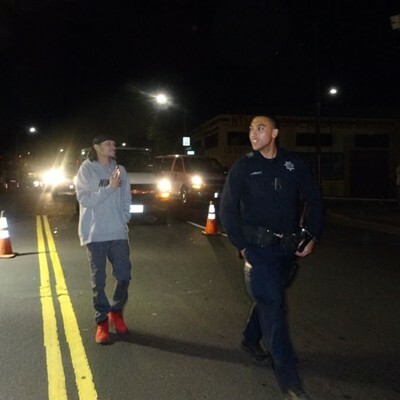 The police department's actions strongly indicated that it's no longer enforcing the mayor's controversial ban. 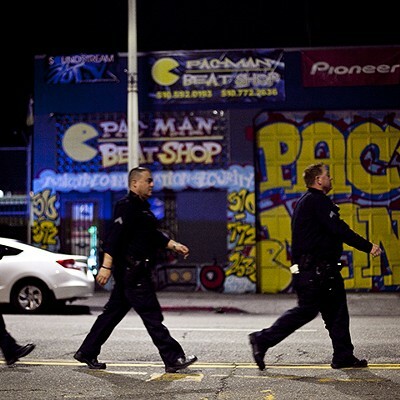 Perkins was shot by four Oakland police officers at a gas station on the corner of 90th and Bancroft avenues. According to OPD, Perkins approached the officers with a “replica” pistol just before the officers shot him. 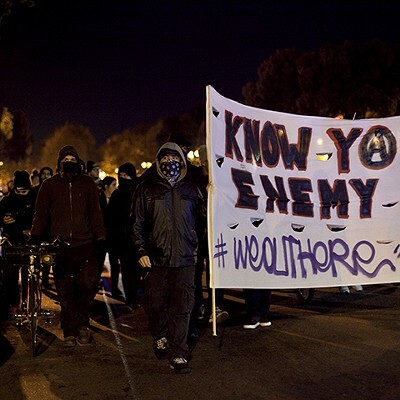 The demonstrators, many wearing masks or bandanas, marched down International Boulevard to Oakland City Hall with a “Know Ya Enemy” banner. 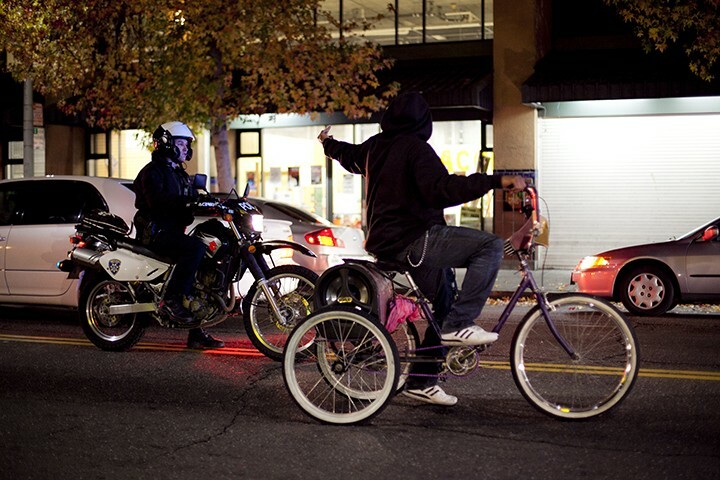 Anti-police anthems were played from a mobile sound system built into a tricycle. 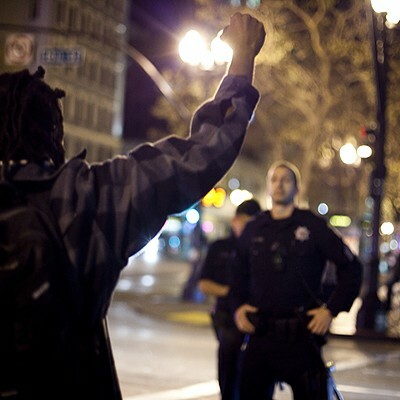 There did not appear to be any arrests related to the demonstration, nor any property damage. Dozens of OPD officers followed the march and at some points surrounded the protesters on three sides. One of the demonstrators, whose brother is currently incarcerated, said everyone at the rally on Friday had one thing in common. 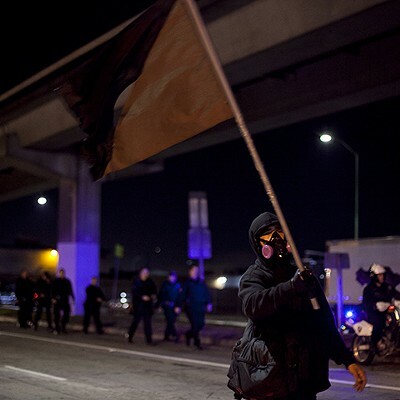 “We’ve all been abused by the police,” said Gerardo Gonzalez. Also spotted at the rally was Ramsey Orta, the New York man who filmed the killing of Eric Garner by New York City police officers in July 2014. Orta told the Express he is traveling to various cities and working with community groups on police accountability projects. 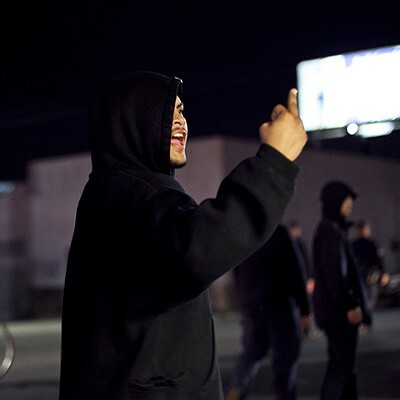 For much of the march, Orta had his cellphone out and was filming the police. Friday’s rally was a smaller gathering than the Michael Brown and Eric Garner demonstrations that took place in the final months of 2014 and early 2015 as part of the national Black Lives Matter movement. 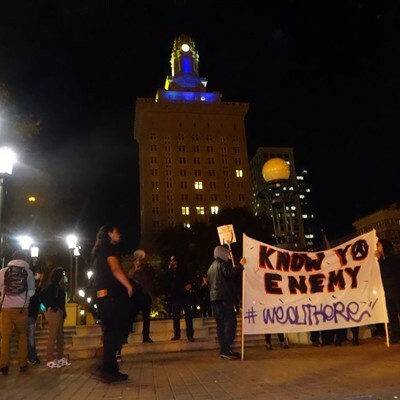 After the fatal shooting of Demouria Hogg in June, hundreds of people gathered at the intersection of Lakeshore Avenue and the Interstate 580 off ramp, where Hogg was shot by a rookie OPD officer. 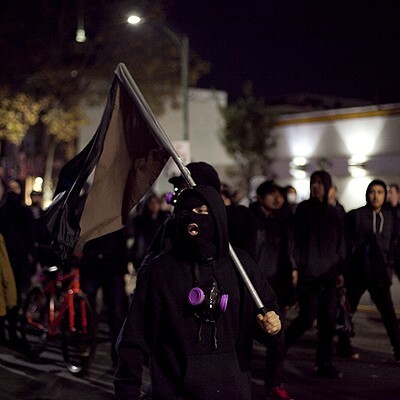 Neither the June demonstration nor Friday’s march was broken up by the police, despite Schaaf’s declarations in May banning nighttime street protests. Schaaf acknowledged the ban at the time and said it was not a new law, but a reinterpretation of an existing one. Schaaf's spokesperson Erica Derryck did not immediately return a phone message today seeking comment as to whether the mayor has officially abandoned her ban on nighttime street marches in the city. One sergeant at Friday’s march told the Express that his officers had not been told to move people off the streets or make any arrests. “We’re here to facilitate this march,” he said.